Design workshops are hands-on sessions allowing small groups of professionals and non-professionals to work creatively together developing planning and design ideas. They will normally be held as part of a planning day or other action planning event. 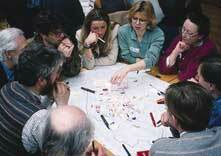 People work in groups around a table with plans or a flexible model. Different groups can deal with different areas or the same area at different scales. Groups can be allocated a topic such as transport, open spaces or housing. Groups can vary in size (8 - 10 is a good average to aim at). Everyone is encouraged to develop their ideas by drawing or making adjustments to the model. Each group usually needs a facilitator, a note-taker and a mapper (who marks points on a map or plan). A structured workshop procedure is often followed, especially if people have not worked together before. (see Design workshop format). Brixton, London, UK, 1993, Nick Wates. Participants use tracing paper over a plan, mini Post-it notes and felt-tip pens to explore options for an inner city neighbourhood. Most have no previous design experience. Using plans is often more suitable than models because little preparation is needed. People generally find it surprisingly easy to read plans once they have started working with them. It helps though if the facilitator has previous experience of design workshops and urban design expertise. Design workshops often work best if people have done a briefing workshop first ( see Briefing workshop). Get people going by telling them that "no idea is too big, no idea too small". At the end everyone should sign drawings and it is often useful to draw up a tidy version for presentation. Main costs: Planning and preparation; facilitator's fees; supplies (see Design workshop format). Sample to suit most contexts. * Where are the problems? * Where are the opportunities? Ideal numbers: 8-10 per workshop. Tracing paper overlays (large sheets and A4 pads) taped with masking tape. Felt-tip coloured pens. Different colours. Mini Post-it notes or small cards. Pin-up space (Blu-tack or pins needed). Base model with movable parts. Post-it notes and cocktail sticks. "Brief intensive brainstorming workshops can be enormously productive - people of mixed backgrounds, grouped together for the first time, with clear challenges, find that they can focus their minds and tap hidden reservoirs of creativity." Chinese University of Hong Kong workshop brief, 1998. Residents and architects devise improvements to a housing estate together. Participant explains design workshop outcome to a plenary session.